The Saudi oil giant is eyeing a stake in the energy assets of the tycoon’s $127 bln Reliance Industries. That would aid Aramco’s strategic ambitions. It would also mean India’s biggest listed group could keep expanding its consumer-to-oil businesses without adding too much debt. The $239 bln U.S. oil giant is buying its domestic peer in a cash-and-shares deal. Hefty synergies more than cover the offered premium. As rivals try to become greener, Chevron is sticking to what it knows by buying big in global oil’s key growth area. Veteran leaders in Algeria and Sudan have been unseated. Rising unemployment, inflation and weak growth are the immediate reasons why, but a broader common theme is too heavy a reliance on crude extraction. That’s not a problem limited to Africa. Britain’s Supreme Court says Vedanta can be sued in London for pollution offences in the African state. Multinationals have tended to trumpet corporate social responsibility at head office, while ignoring sins at subsidiary level. Whatever the case’s outcome, that will change. Frantic demand for the oil giant’s $12 bln bond issue might be interpreted as a sign of support for the desert kingdom’s efforts to diversify its economy. Yet securing long-term investment is harder than selling securities. And only some of the buying reflects genuine enthusiasm. Strong demand for the oil giant’s first bond allowed it to raise $12 billion at lower rates than expected. Borrowing costs are still higher than Western oil peers. But it makes little sense for investors to view the bonds as less risky than Saudi’s tarnished government. The Russian owners of Evraz recently cut their stake below 50 pct, which offsets potential heat over their Kremlin links. That doesn’t mean fellow metal groups like Severstal need to follow suit. Still, Oleg Deripaska’s recent travails imply little cause for complacency. Officials are scrutinising Canadian exporters of the stuff on quality concerns. China’s status as a giant trader is one of its few real geopolitical levers. But using health and safety for political ends also hampers watchdogs doing much-needed work to improve standards at home. A fatal dam accident in January wiped almost $21 bln off the Brazilian company’s value. It has since clawed back most of that sum, thanks in part to a jump in the mineral’s price. Given the long-term cost of Vale’s second accident in three years, the recovery looks premature. The Saudi oil giant’s debut bond prospectus shows $111 bln of net income in 2018. Yet Aramco will only pay half the $69 bln needed to acquire Riyadh’s SABIC stake upfront. Potential debt and equity investors will be heartened that there is an implied limit to government meddling. Grains trader Cargill is the latest company to cite outbreaks of the highly contagious hog disease as a drag on business. It’s likely to fuel fears that the world's biggest pork producer may be under-reporting the issue. The taint adds to Beijing's fast-spreading problem. 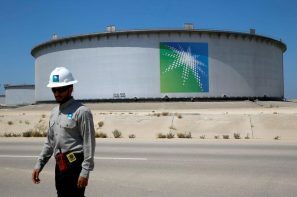 Aramco is buying a 70 pct stake in chemical group SABIC from the kingdom’s sovereign wealth fund. The reshuffle is mostly an internal affair but the oil giant will issue bonds to pay for it. That gives banks who have spent years courting the company some return for their efforts. The gold miner’s $10 billion Goldcorp offer terms aren’t good enough for the hedge fund manager, who owns a 2.7 percent stake. He has a point – recent gold deals haven’t featured premiums. But his campaign might have gained more traction had he started earlier. PetroChina’s losses on gas imports swelled to nearly $4 bln in 2018, thanks to low domestic rates. Yet China’s oil giants are preparing to buy more LNG from U.S. firms. That aids the trade cause. More importantly, it may help lock in supply before a forecast shortfall. Oslo’s $1 trillion wealth fund will ditch oil exploration stocks, but stay invested in groups that also do refining. As a big producer Norway needs to tread carefully. But accepting the risk of subpar returns could have been a way to show greater climate change leadership. Newmont has rejected an $18 bln stock offer from Barrick, saying shareholders fare better in its agreed purchase of Goldcorp. But Barrick’s arguments – and bigger benefits for Newmont’s owners – hinge on the two joining forces in Nevada. Neither merger is required for that. Fábio Schvartsman has stepped down weeks after a fatal dam collapse. Waiting for prosecutors to push the issue is bad form. Safety and governance will have to become bigger priorities for the $65 bln Brazilian miner, but many strategic and operational ideas are worth preserving. Re-elected President Muhammadu Buhari faces a daunting to-do list. His first term suggests most of it will stay undone. Easing the state’s grip on the currency and oil sector could revive growth. That the former general’s main rival backed such reforms means neither is likely. Including a special payout, the digger led by Jean-Sébastien Jacques returned a whopping $13.5 bln to shareholders last year. Despite Rio's ample cash, risks are rising and safety problems like Vale’s will lift costs. That should keep the industry's growth ambitions in check. Barrick Gold's $18 bln all-share bid for U.S. rival Newmont has a shred of financial logic from putting together neighbouring mines in Nevada. That's buried, though, beneath opportunism and hubris. The slim uplift for Newmont shareholders further dulls the deal's prospects.